Vodafone (VOD) was founded in 1984 in the U.K. and has quickly grown into one of the world’s largest telecom conglomerates. Along with its joint venture partners, the company offers telephone, internet, cable TV, and wireless mobile services in 72 countries on six continents. 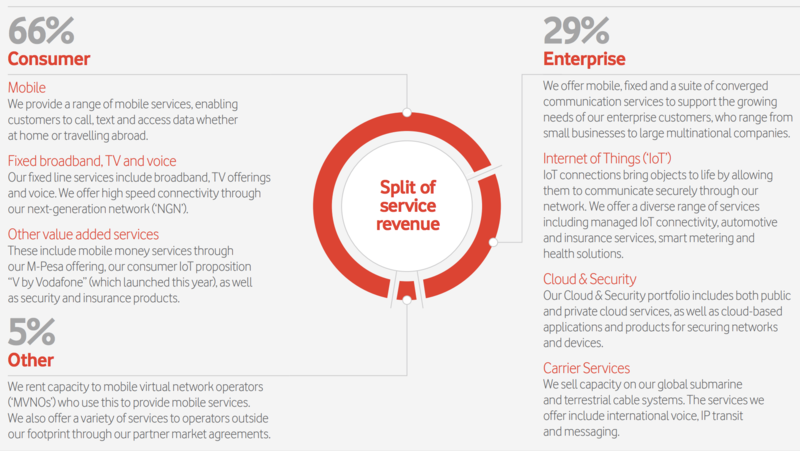 In total, Vodafone serves 536 million mobile customers and 20 million broadband customers. While Vodafone’s global diversification is impressive, the vast majority of its business remains dominated by Europe, which accounts for 75% of its revenue. The company is especially dependent on Germany (25% of sales), the UK (15%), and Italy (13%). The company’s long-term plan calls for continued diversification into emerging markets, especially India. However, in the past year expanding into the Indian market has proven more challenging than previously expected. Like many large telecoms, Vodafone has struggled with cord cutting (in pay TV) and slow revenue growth in recent years. That's why Vodafone launched a major three-year restructuring plan in 2013 called "Project Spring". These purchases (which have been followed up by broadband acquisitions in recent years) were part of the company's attempt to ramp up its 4G LTE network in Europe which was much less developed than in the U.S.
Vodafone’s M&A spree was driven by the company’s positioning as pretty much a pure play wireless company, but one with very little exposure to 4G. In fact, in mid-2014, Vodafone had less than 5 million 4G customers in Europe and was losing market share quickly. However, Vodafone now offers a full suite of telecom services, including landlines, cable TV, internet, and far improved wireless services. Meanwhile, Vodafone's $23 billion merger with India's Idea Cellular (closed in June 2018) about doubles the company's wireless customers in that fast-growing market from 223 million to over 400 million. 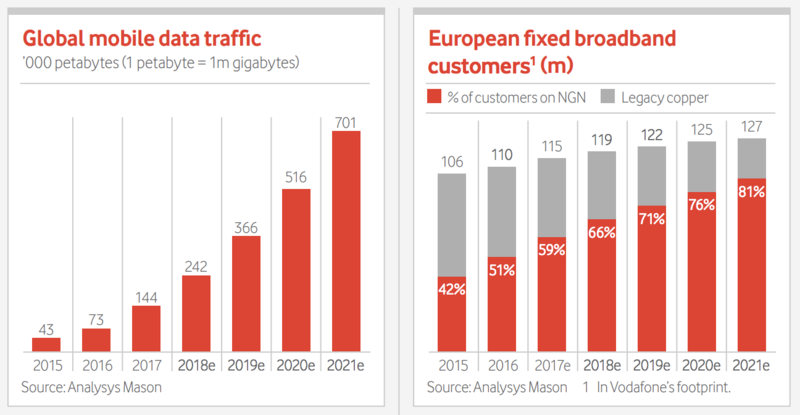 In recent years, Vodafone has been focused on broadband internet in Europe, especially in Germany (its largest market). By 2020 the company hopes to be able to offer 1 gigabit home internet service to 12.7 million customers in that country and has a goal of eventually delivering 10 gigabit internet speed. For context, that is about 100 times faster than its average customer enjoys today. All told, Vodafone's ambitious investments, as well as Project Spring, have allowed the company to become either the No. 1 or No. 2 provider in almost all of its key markets. The company owns Europe's largest broadband network, positioning it to benefit from long-term growth in mobile data traffic as landline use continues declining. Vodafone's high market share also allows for improved economies of scale, meaning the company can spread its enormous fixed costs over the largest possible customer and revenue base. While this has helped the company generate decent free cash flow and slightly above average margins compared to peers, acquisitions have weighed on Vodafone's return on invested capital (a proxy for management's long-term capital allocation skills). The company has struggled to integrate some of its acquired businesses in Europe. Meanwhile, in India Vodafone is locked in a ferocious price war with numerous smaller rivals (the T-Mobile's of India) that has resulted in revenue falling nearly 20% in the past year. Part of the reason for the decline is increased regulatory pressures which have not allowed Vodafone to price its services as high as management would have liked. Due to the capital intensive nature of this industry, as well as Vodafone's aggressive acquisition strategy to gain market share, the company has a large but not unmanageable amount of debt. Like many large telecoms, Vodafone has a large amount of debt ($55 billion in total). However, its debt load is amply covered by its increasingly stable and large cash flow. As a result, the company enjoys a BBB+ credit rating from Standard & Poor's. Vodafone can also borrow at very low cost in Europe, where interest rates remain near zero. This is why Vodafone is able to achieve an average interest rates on its debt of about 2.8% (lower than the 10-year U.S. Treasury yield). This financial flexibility is going to be useful in the future as the company continues its push into emerging markets and building out its European 5G network. 5G is the next generation of wireless technology and promises numerous benefits that could prove game changers for the telecom industry, including much faster speeds and greater data capacity. 5G will not just offer much faster wireless data for smartphones but also is the key to providing home internet wirelessly, which potentially threatens to disrupt legacy broadband internet providers like Vodafone. Thus the company has been proactively upgrading its 4G network in Europe, making it 5G ready in order to be able to avoid being disrupted by smaller rivals who want a piece of its enormous broadband cash flow. In addition, despite its struggles in India, the company continues to believe that country represents an important growth driver. That's why in April 2018 Vodafone orchestrated the merger of Indus Towers with Bharti Infratel, creating India’s leading listed tower company in which it will own a significant liquid stake. Basically, Vodafone plans to continue expanding in India while it attempts to gain market share and stronger pricing power over time via superior services. Thanks to 5G initiatives in Europe and continued investments in fast-growing emerging markets, Vodafone could be positioned for solid earnings growth over the years ahead. However, the company faces several risks that might mean its future growth falls far short expectations. Vodafone is going to struggle with several key issues in the coming years. For one thing, the company faces a lot of currency risk, given that it does business in Euros, British Pounds, Indian Rupees, and several smaller emerging market currencies. The relative value of these currencies can fluctuate wildly at times, especially in emerging markets. This can create growth headwinds any given quarter for this slow-growing giant, specifically if the Euro appreciates against local currencies (thus reducing its Euro denominated sales and cash flow). Another thing to consider is that, while most telecom markets are highly regulated, the regulatory environments in which Vodafone is attempting to grow are stricter than most. For example, European regulators want to maintain a more fractured market to drive higher price competition. This means Vodafone isn't likely to be granted the ability to buy any major mobile rivals. And in its largest market, Germany, regulators have three times blocked major broadband acquisitions in the past. This bodes poorly for Vodafone receiving regulatory approval for some of its more recent purchases. In addition, given that it is the continent's leading broadband provider, Vodafone's ability to acquire other internet companies is likely constrained as well. This means that Vodafone's largest source of sales and cash flow is likely to struggle with growth, given the shrinking EU population and lackluster economy. In fact, Vodafone saw its European wireless base shrink by 1.5% in the past year. What about emerging markets, especially India? While the growth potential there is certainly enormous (India will soon become the largest country by population), that country might fail to prove as strong a growth driver as investors might hope for several reasons. First, India's economy might be growing quickly, but it is still a very poor country. For example, in 2017 the country's GDP per capita was just $1,983. And by 2022 that is expected to rise to $3,007. While that's some impressive growth it also means that, at least for now, Indian wireless customers remain highly price sensitive. Reliance Jio is a newly launched Indian competitor that plans to compete with Vodafone not just on wireless but internet as well. Reliance Jio is already very popular in India and has an aggressive strategy of giving away data for free to win market share. And because Reliance was launched with a lot of capital behind it, this might mean that Vodafone could be trapped in a price war for several years that causes its Indian operations to underperform. That's because Vodafone, while the largest wireless provider in India (about 35% market share), faces six major rivals that are willing to compete fiercely on price. Then there is India's regulatory environment which puts even the strict EU regime to shame. India is notorious for its red tape because of decades of socialist rule and government central planning of the economy. In recent years more free market reforms have occurred, but the government of India remains prone to bouts of unexpected interference that can be very costly to Western companies. For example, in 2017 India retroactively raised Vodafone’s taxes by $2.5 billion over its 2007 acquisition of Indian telecom Hutchison Essar. This forced the company to take a 5 billion Euro write-down in 2016 and shows that making long-term profitable investments in India is far easier said than done. And speaking of write-downs, remember that Vodafone has a terrible track record of overpaying for acquisitions. In fact, since 2006 the firm has written down over $90 billion in losses on its acquisitions due to vastly overpaying for them. Management has a questionable track record of allocating shareholder capital, and the latest gamble in India needs to pay off. Finally, while Vodafone's yield is very high, the company's dividend is variable due to currency exchange rate fluctuations between the Pence Sterling (the UK's currency) and U.S. Dollar. The firm's dividend is paid out semi-annually, and while it has increased each year since 2000 in Pence Sterling, the actual amount U.S. investors receive will fluctuate. This means that Vodafone might be a poor choice for conservative income investors looking for very stable and rising payouts. Vodafone is one of the world's largest telecom companies, with a deeply entrenched presence in its core European markets. The company's attempts at diversifying into faster-growing markets such as broadband and wireless services in emerging market give it a longer growth runway that could result in rising dividends over time. Under new management, which is more focused on disciplined acquisitions, Vodafone has the potential to become a more profitable and faster-growing company. That being said, Vodafone's poor history of overpaying for acquisitions, struggles with executing on its growth plans, and exposure to less business-friendly regulators around the world mean that more conservative income investors might want to steer clear in favor of more dependable rivals such as Verizon (VZ).